The new look of the Crown Trade Clean Extreme collection highlight emphasise the product’s 100% increase in stain resistance, compared to regular matt vinyl emulsion paint, with the ability to scrub it up to 10,000 times. 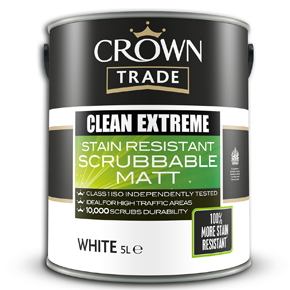 Available in Scrubbable Matt and Durable Acrylic Eggshell, Crown Trade Clean Extreme has an ISO 11998 Class 1 scrub rating and is designed to withstand rigorous cleaning regimes, therefore reducing the need for expensive redecoration by lowering wear and tear. This guarantees the product retains its impressive finish for a substantial amount of times, extending maintenance cycles in areas of heavy traffic. Independently tested for surefire results and delivering a time-proven finish, Crown Trade Clean Extreme is the perfect choice for busy areas, such as schools, universities and student accommodation, nurseries, hospitals, offices, leisure facilities and housing association properties. Sharon Smith, Crown Paints Trade Communications Manager, spoke about how both the Scrubbable Matt and Durable Acrylic Eggshell provide a finish 100% more stain resistant compared to standard matt vinyl emulsion. “They have superior cleaning capabilities which do not compromise the integrity or finished appearance of the paint film,” she said. “New and aged stains can be easily cleaned away, returning walls to an ‘as new’ condition and reducing the need for costly redecoration. For over two centuries, Crown Paints has manufactured paints that blend quality with innovation, offering a trusted means of transforming and protecting environments, both indoors and out.